The sixth ship using the name Saratoga was built at the New York Naval Shipyard and commissioned on 14 April 1956. The ship’s name comes from the Revolutionary battle of Saratoga. Her first trip out took her to the Norwegian Sea to participate in NATO exercises. Her next voyage was the first of eight to the Mediterranean taken annually from 1959 through 1967. In 1967, she was in the area when the Six Day War broke out. In 1968, the ship was sent to Philadelphia for a yearlong modernization and overhaul. By July 1969, she was back in the Mediterranean. She continued visiting this area until her first deployment to the Pacific. In April 1972, Saratoga was sent to the Pacific to help with Vietnam War efforts. For the next several months, the ship’s aircrew flew hundreds of missions against the enemy. In that time, a few were lost. After her Vietnam visit, the ship went back to operations in the Mediterranean with the Sixth Fleet. Saratoga was one of two aircraft carriers to challenge Libya in 1986. The early 1990’s saw the ship actively engaged in Operation Desert Storm with over 10,000 active missions. She was decommissioned on Aug. 11, 1994. The fifth Saratoga (CV-60) was laid down on 16 December 1952 by the New York Naval Shipyard New York City N.Y.; launched on 8 October 1955; sponsored by Mrs. Charles S. Thomas; and commissioned on 14 April 1956 Capt. R. J. Stroh in c ommand. For the next several months Saratoga conducted various engineering flight steering structural and gunnery tests. On 18 August she sailed for Guantanamo and her shakedown cruise. On 19 December she reentered the New York Naval Shipyard and remained there until 28 February 1957. Upon completion of yard work she got underway on a refresher training cruise to the Caribbean before entering her home port Mayport Fla.
On 6 June President Dwight D. Eisenhower and members of his cabinet boarded Saratoga to observe operations on board the giant carrier. For two days she and eighteen other ships demonstrated air operations antisubmarine warfare guided miss ile operations and the Navy's latest bombing and strafing techniques. Highlighting the President's visit was the nonstop flight of two F8U "Crusaders " spanning the nation in three hours and twenty-eight minutes from the Bon Homme Richard (CVA-31) on the west coast to the flight deck of the Saratoga in the Atlantic. The carrier departed Mayport on 3 September 1957 for her maiden transatlantic voyage. Saratoga sailed into the Norwegian Sea and participated in operation "Strikeback " joint naval maneuvers of the North Atlantic Treaty Organization countries . She returned briefly to Mayport before entering the Norfolk Naval Shipyard for repairs. On 1 February 1958 Saratoga departed Mayport for the Mediterranean and her first deployment with the Sixth Fleet. >From this date through 31 December 1967 she was to spend a part of each year in the Mediterranean on a total of eight cruises. The remainder of the time she either operated off the coast of Florida or was in port undergoing restricted availability. While deployed with the Sixth Fleet on 23 January ]961 a serious fire broke out in Saratoga's number two machinery space which took seven lives. The fire believed caused by a ruptured fuel oil line was brought under control by the crew an d the ship proceeded to Athens where a survey of the damage could be made. On 2 January 1968 Saratoga sailed for Philadelphia and an overhaul and modernization program which was to last 11 months. On 31 January 1969 she departed Philadelphia for Guantanamo via Hampton Roads and Mayport and extensive refresher tr aining of the crew and air detachments. On 17 May Armed Forces Day she was the host ship for President Richard M. Nixon during the firepower demonstration conducted by Carrier Air Wing Three in the Virginia Capes area. On 9 July she departed Mayport for her ninth Mediterranean deployme nt. Underway a Soviet surface force and a "November" class submarine passed in close proximity en route to Cuba. Off the Azores on 17 July Saratoga was shadowed by Kipelovo-based Soviet aircraft. They were intercepted photographed and e scorted while in the vicinity of the carrier. She operated with Task Group 60.2 of the Sixth Fleet in the eastern Mediterranean during September in a "show of force" in response to the large build-up of Soviet surface units there the hijacking of a Trans World Airlines plane to Syria and the political coup in Libya. Numerous surveillance and reconnaissance flights were conducted by Carrier Wing Three aircraft against Soviet surface units including the carrier Moskva operating southeas t of Crete. Saratoga operated in this area again in October because of the crisis in Lebanon. She returned to Mayport and the Florida coast from 22 January until 11 June 1970 when she again sailed for duty with the Sixth Fleet. On 28 September President Richard M. Nixon and his party arrived on board. That night word was received that Gamal Abdul Nasser President of the United Arab Republic had died; an event that might plunge the entire Middle East into a crisis. The intelligence and communications personnel of the Saratoga were required to supply the President Joint Chiefs of Staff and the Secretaries of State and Defense with the essential intelligence information to keep them abreast of the deteriorati ng situation. The Presidential party departed the ship the next evening and Saratoga continued on patrol in the eastern Mediterranean until she sailed for the United States on 2 November. 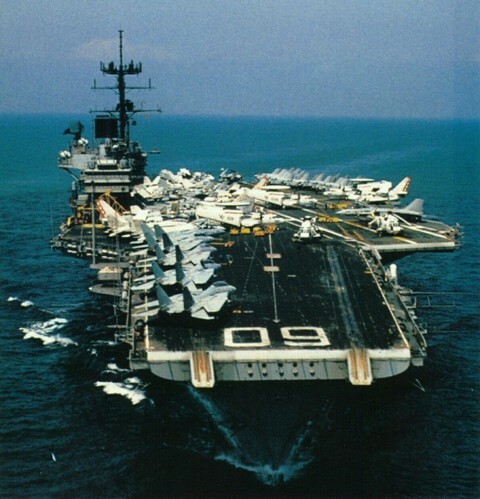 From her arrival at Mayport until 10 March 1971 she was in a "cold iron" status. She then operated off the Florida coast until 7 June when she departed for her eleventh deployment with the Sixth Fleet via Scotland and the North Sea where she participated in exercise "Magic Sword II." She returned t o Mayport on 31 October for a period of restricted availability and local operations. On 11 April 1972 Saratoga sailed from Mayport en route to Subic Bay P.I. and her first deployment to the western Pacific. She arrived in Subic Bay on 8 May and departed for Vietnam the following week arriving at "Yankee Station" on 18 May for her first period on the line. 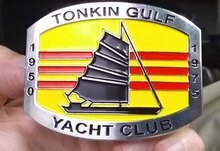 Before year's end she was on station in the Tonkin Gulf a total of seven times: 18 May to 21 June; 1 to 16 July; 28 July to 22 August; 2 to 19 September 29 September to 21 October; 5 November to 8 December; and 1 8 to 31 December. During the first period Saratoga lost four aircraft and three pilots. On the plus side on 21 June two of her "Phantoms" attacked three MiG 21s over North Vietnam. Dodging four surface to air missiles they managed to down one of the MiG a ircraft. Saratoga's planes attacked targets ranging from enemy troop concentrations in the lower panhandle to petroleum storage areas northeast of Hanoi. On her second line period she lost an F-4 to enemy fire northeast of Hanoi with the pil ot and radar intercept officer missing in action. During this period her aircraft flew 708 missions against the enemy. On 6 August Lt. Jim Lloyd flying an A-7 on a bombing mission near Vinh had his plane shot out from under him by a SAM. He ejected into enemy territory at night. In a daring rescue by helicopters supported by CVW-3 aircraft he was lifted from th e midst of enemy soldiers and returned to the Saratoga. On 10 August one of the ship's CAP jet fighters splashed a MiG at night using "Sparrow" missiles. During the period 2 to 19 September Saratoga aircraft flew over 800 combat strike missions against targets in North Vietnam. On 20 October her aircraft flew 83 close air support sorties in six hours in support of a force of 250 Territorials beleaguered by the North Vietnamese 48th Regiment. Air support saved the small force enabled ARVN troops to advance and killed 102 North Vietnamese soldiers. During her last period on station Saratoga's aircraft battered targets in the he art of North Vietnam for over a week. Saratoga departed "Yankee Station" for Subic Bay on 7 January 1973. From there she sailed for the United States via Singapore and arrived at Mayport on 13 February 1973. As of 1 January 1974 Saratoga was on active duty with the Atla ntic Fleet.